Yesterday marked the end of the consultation period for Eastleigh’s latest incarnation of the local plan – which would see a potential 5000-house project on green field space in Bishopstoke, Fair Oak and Horton Heath. If the largest of eight plans were approved, the new properties would account for 20% of target new builds in Hampshire. Locals in Fair Oak are very concerned as they say such a major development could overwhelm the village. A large group of worried residents held their own public meeting at Horton Heath Community Centre this week to discuss the implications of large scale building on their doorstep and possible actions to prevent it. 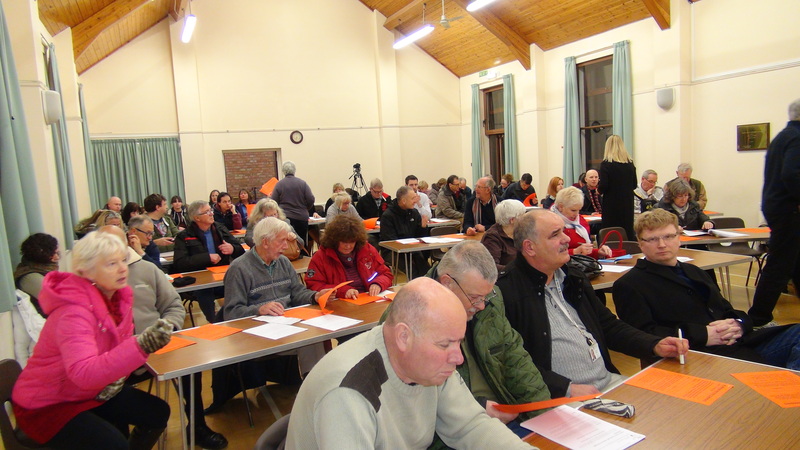 This comes after the Parish Council in Fair Oak released a draft response to the eight planning options – but many villagers told the packed meeting they felt it did not sufficiently represent their concerns and that the Parish Council had not properly consulted them. During the meeting attendees were invited to respond to a survey designed to gauge their feelings on more housing in the area. The meeting was also attended by Ukip’s three Hampshire County Councillors for Eastleigh who were sharply critical of the record of borough’s administration regarding the previous failed plan. The councillors also said they thought that the area’s existing sewage system would not be able to cope with further population growth. Resident’s across the borough now face an anxious wait as Eastleigh planning bosses decide which areas they will proceed with. It is good to see local people talking together and taking action on issues that will have a major impact on their communities for generations to come but sadly history has shown us that Eastleigh Lib Dem councillors have no interest in the environment, local communities or what local people feel and have to say on these issues. Time and time again these evil Fib Dems go ahead with their own agenda regardless. The only way to make a change and protect our communities and green spaces in the borough is to remove these very people who have year after year abused our trust. Remember how they cut down a historic tree to make way for a dance venue, which now sits empty and unused. How they built on your public green spaces in the town centre and how they tried to sell off public recreation land to Sainsbury’s in the town centre. It’s time to make a stand and say no more.